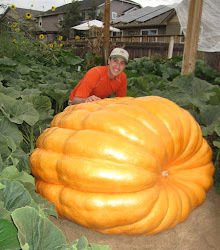 I'm going to be teaching at the speaking at the Utah Giant Pumpkin Growers Seminar on Saturday, March 10th at the Mountain Seed Co. in Salt Lake. The seminar is from 10:00 to 1:00. Meet a great bunch of growers as well as learn the basic and advanced techniques of giant pumpkin growing. I'll be pointing my Power Point presentation from the seminar here. I apologize for it being so long since my last posting. Usually in the winter I post less, but things have been a little crazy for the last two months. I was hoping to have a big announcement here by now, but some different things have held that up, so I'm hoping in the next month to talk a little more about what is coming.